After much anticipation we were presented with the Porchetta appetizer ($18). Accompanied by asparagus, chicory, a soft-boiled egg, Truffle-Parmesan fonduta and Tuscan bread, this beautifully plated dish was as delightful to the palette as it was to the eyes. Readers may want to take note that the serving is indeed generous and incredibly rich. It would be suitable as a main course or shared as an appetizer. Next to arrive, also on the Easter Menu, was the Grilled Lamb Loin ($55). Served over a carrot purée, with morels, green peas, fiddlehead ferns, pickled rams and a ramp chimichurri, the dish brimmed with the colors of Spring. The lamb, succulent, incredibly mild, was served quite pink, with a seared crust. Chef Julio’s artistry is never lost on us. When the talented cook is not creating in the kitchen, you can find him with brushes in hand, coloring his canvases in bright, vibrant hues, with bold, expressive strokes. On his day off, he heads off to his weekly art class. From palette to plate, from appetizer to desert, each item that was presented to us was visually stunning. The Coconut Mascarpone Cheesecake ($12) took us by surprise. The unique choice of flavors was so well matched – the tart of the kumquat balanced the sweet of the caramel and coconut flavors. The cake itself caught us off-guard. It didn’t have the heavy dense-like mouth feel of a traditional cheesecake, but offered a texture reminiscent of the Italian varieties, one that is lighter and airier. It could have ended there, and for the sake of my waistline it should have ended there… but it did not! Appearing on the Spring menu, guests will enjoy the Halibut with Quinoa Crust served with Spring onion, baby zucchini, Patty pan squash, cherry tomatoes and baby sweet peppers. The flaky halibut is topped with a beautiful ruby-colored quinoa that once bitten into offers up an incredible crunch. A new dessert makes the lineup as well. 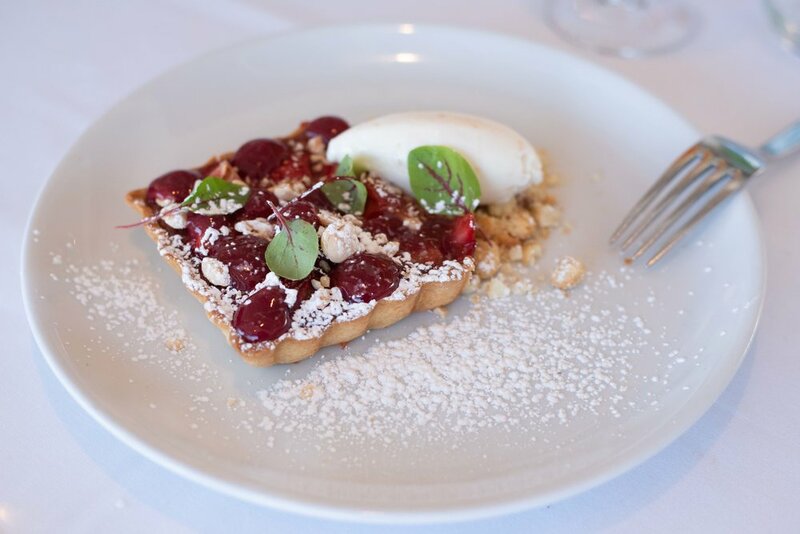 The Strawberry Rhubarb Tart with toasted almond gelato and Marcona Almond crumbs is simply too good to enjoy on a full stomach. We definitely approve of an après dinner visit for dessert and a glass of wine. The restaurant’s Wednesday Night Dinners are very popular and a great way to sample the menu, with or without wine pairings as are the Sunday Night Prix Fixe Dinners. Whether Surf or Turf, Prime has something for every palate and we’ve yet to try something that hasn’t pleased us. Finally, we would be remiss not to mention their sensational selection of sushi, which we always take advantage of. It’s truly some of the best in Connecticut. For more information visit Prime Stamford’s website.